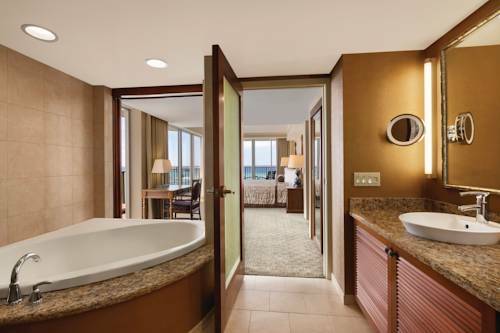 Once a place of healing/rejuvenation for Hawaiian royalty- the beachfront Outrigger Reef Waikiki Beach Resort offers guests the opportunity to immerse in traditional Hawaiian culture. Guests are invited to take part in a variety of cultural activities- stringing flower leis/learning to play the ukulele- listening to Hawaiian folklore/dancing the hula without ever having the leave the property. Traditional and contemporary Hawaiian music performed live nightly by award-winning musicians at the resorts renown Kani Ka Pila Grille frequented by locals and guests alike. Couples can experience a traditional Hawaiian Vow Renewal Ceremony with accompanying chants/hula right on the beach. Reef Bar and Market Grill: Experience the ultimate in beachfront dining at the Reef Bar and Market Grill. Where the combination of locally-sourced meats and seafood farm fresh produce and invigorating trade wind breezes is an incomparable recipe for the perfect meal. Diamond Head Terrace 1-4: Air walls available to divide room into max. of 4 rooms- half or 3/4 of terrace. Adjoining outdoor courtyard w/wooden shutters that open to a picture window allowing natural lighting. Our resort is on the Island of Oahu in the city of Honolulu. Resort is at the beginning of Waikiki area nestled close to all the main streets including Kalakaua Avenue. Just steps from shopping and dining on the Waikiki Beachwalk promenade.